A deadly shell game of stolen paintings. But the dead body she just watched drop isn't talking. Madison was supposed to be there for a modeling gig, not to hit a fine art collection. But snuggling with Xander in the dark was the perfect distraction, and now she's involved. What is he hiding? Soon shrouded information and sealed allegations reveal a piece of Xander's tangled past. The news is bad, and quickly turns to a chase for a valued art piece. The show must go on, but anonymous text messages are saying one murder down... and one to go. A humorous mystery laced with romantic comedy. "I just found myself hanging on for the ride!" "I stayed up way too long finishing this tonight. Totally worth it!" "Wow--the story jumps right into the action and humor, and keeps it going throughout the entire book." "You'll love this book if you like zany mysteries with a romantic zip. I did!" "By the end of this book you will have screamed, laughed, cried and been thoroughly entertained." "I didn't guess who the villain was until Madison figured it out - WOW...I'm looking forward to the next installment!" 5.0 out of 5 starsHit this book for an entertaining read! Once again, Lucy Carol delivers with this fast paced, action packed adventure. I love the combination of mystery, romance and comedy rolled into her books. A great read! Wow--the story jumps right into the action and humor and keeps it going throughout the entire book. With an FBI mother, an ex-KBG grandmother and a possible art thief for a boyfriend, who's Madison to believe? I'd love to go into lots of detail, but don't want to spoil the book. Suffice it to say, there's stolen artwork, FBI shadowing, murder, family drama and a modeling job with a surprising finish. I am so looking forward to the next book in the series! 5.0 out of 5 starsLucy Carol's best book! I have read all the Lucy Carol books, I find her sense of adventure and humor mixed with you-don't-know-what's-going-to-happen-next refreshing and entertaining. 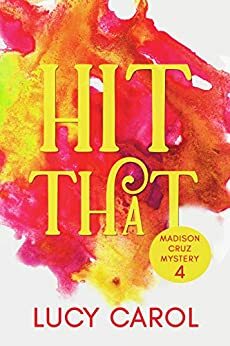 Invariably, Madison Cruz' exploits go to places and scenarios I've never been to, which also adds to the interest. More importantly, I've watched the author grow through the 4 books. Her attention to detail, the observations she makes so naturally and cleverly, the turn of phrase, the humorous and believable accent of the Russian grandmother, all combine to make a highly satisfying and fun read in this 4th effort. I felt like in this book the writer went from an 'A' student to an "Advanced Placement" student/writer. If you want an engaging book that's fun and hard to put down, you've found it! I stayed up way too long finishing this tonight. Totally worth it! I love Madison, her men, her friends and family. The mysteries, the plot twists and turns. Mystery, suspense,Romance, humor,danger,fast pace. 5.0 out of 5 starsKooky mystery with a drop of romance! I love me some Madison Cruz!! I have read all four now, and I find them all delightful and fun! Ms. Carol's writing style is lighthearted with enough mystery to the plot to keep you interested to the last page. Madison is up against some bad guys again, and somehow she figures it all out, while dealing with an ex-boyfriend, her mom and grandmother, friends and enemies. You can't help but root for her, whether she is acting smart or being crazy. You'll love this book if you like zany mysteries with a romantic zip. I did!!! 5.0 out of 5 starsDefinitely! I have been waiting soooo very long for this book, but it was definitely worth the wait! Starving actress, Madison Cruz, is back but this time strutting her stuff on the runway. As the plot becomes more entangled she has to deal stolen paintings, Russian spies, murder, & her FBI Special Agent Mom. Everything changed so quickly, I just found myself hanging on for the ride! Her Warrior Woman was phenomenal & the ending perfect!! !